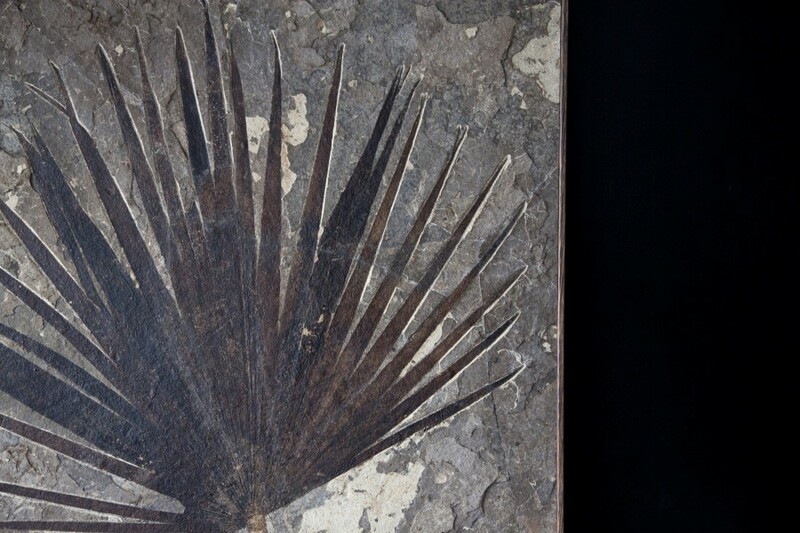 Although the slab shows a common leaf, this palm frond boasts a 55-million-year old history. The palm is a common tree today, but ancient species existed from 80 million years ago. By 60 million years ago, palms were far more widespread due to a warmer climate. 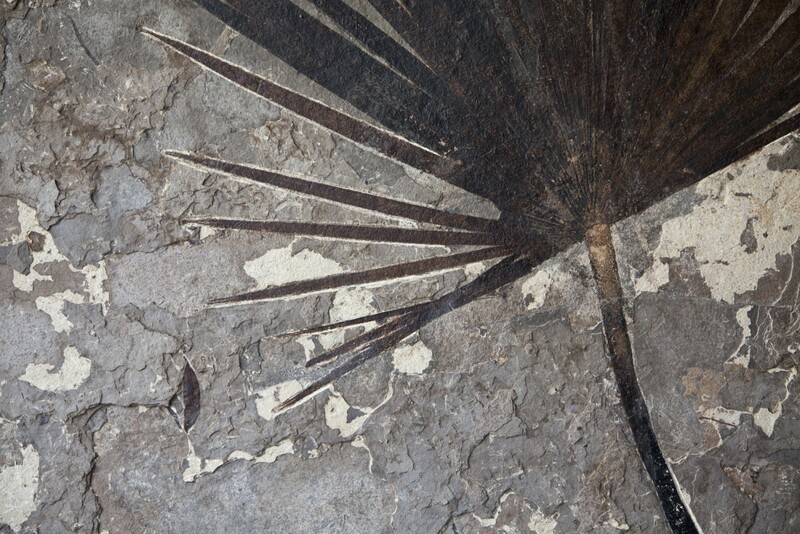 The palm tree, from which this fossil came, grew in sub-tropical North America in the early Eocene period. 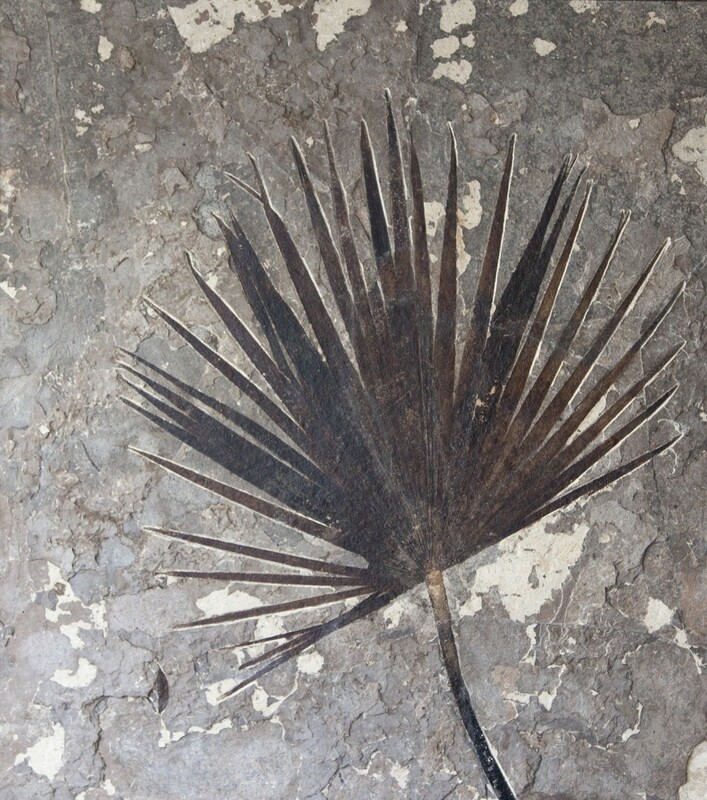 From the palm frond’s surrounding environment, we know that it fell to the bottom of a freshwater lake after breaking off, where it was preserved by an anoxic environment (scavengers could not eat it as there was no oxygen to breathe). It would have been quickly covered by sediment, which was then compacted as the Rocky Mountains rose above and around the lake of its burial in current Wyoming, USA. Thus, this delicate palmite palm frond has been preserved in situ. After being carefully recovered, the slab was professionally prepared to highlight the brown organic matter. Very few environments around the world enable such a perfect preservation, as the organic material easily rots away, or is eaten. Even the intricate veins can be seen in this specimen! These provided structural support and transport of water and vital minerals in the leaf. The combination of the palm frond’s image of idyllic beaches with the million-year old history will add a feel of ancient luxury and wonder to any space.